The Samajwadi Party boss expelled Akhilesh and National General Secretary Ram Gopal Yadav from the party for six years over indiscipline. 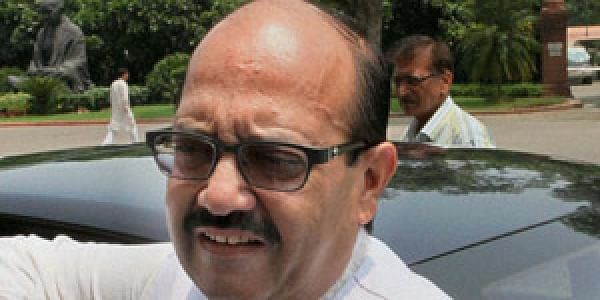 LONDON: A day after the feud in the Samajwadi Party widened with the suspension of Chief Minister Akhilesh Yadav, the party’s general secretary Amar Singh on Saturday said he is supporting party’s chief Mulayam Singh Yadav and going against his decision is unconstitutional and immoral. Quoting a line from Srimad Bhagwat Puran : “Ram chandra keh gaye siya se aisa kalyug aayega, beta karega raj bechara baap jungal ke jayega,” Singh said that Mulayam is not only the father of the party but also the father of Uttar Pradesh Chief Minister. “Those who are going against him are unconstitutional, immoral and are incorrect and I condemn them,” he told ANI. Dubbing the rift taking place in the Samajwadi Party as ‘unfortunate’, Singh appealed to the party workers to support Mulayam in this crucial situation. Meanwhile, Mulayam has called a Samajwadi Party's Parliamentary board meeting today. The Samajwadi Party boss yesterday expelled Akhilesh and National General Secretary Ram Gopal Yadav from the party for six years over indiscipline. "I solely founded the party, what is their (Akhilesh and Ram Gopal) contribution? They are destroying the party," he said. "To save the party, we have expelled both Ram Gopal and Akhilesh Yadav for six years from the party. No one has the right to call for a national executive meeting other than the party chief, and by doing this, you (Akhilesh and Ram Gopal) have hurt the party's interest,"he added. This move comes after Akhilesh had released a list of 235 candidates out of the total 403 seats for upcoming state assembly elections on Thursday, rejecting the list announced by Mulayam Singh Yadav on Wednesday. "We have declared a list of 325 candidates for the 2017 assembly polls; 78 seats still remain. Names of the candidates for the rest of the 78 seats will be announced soon," Mulayam had said on Wednesday. Akhilesh's name did not figure in the first list. Mulayam said his son being the chief minister, can contest from any assembly seat he wishes to.